The clouding of a normally clear lens of the eye is referred to as a cataract. Symptoms of cataracts include difficulty seeing at night due to glare, difficulty driving in the rain and at night, cloudy vision that affects daily activities and reading. Cataracts can be treated with a simple, outpatient surgery and requires no stitches by the eye surgeons at TC Eye. The artificial replacement lens used to replace your cataracts is called an intraocular lens or I-O-L for short. These IOLs are smaller than a penny and are highly advanced medical devices that are designed to mimic your natural crystalline lens. Standard and premium lenses are offered at Traverse City Eye including Alcon® and Tecnis® Toric lenses to treat astigmatism and multifocal lenses including Tecnis Symfony® and ReSTOR® with ActiveFocus™ lenses. TC Eye also offers the options of laser cataract surgery and dropless cataract surgery as well as glaucoma treatment at the time of cataract surgery. Different types of implantable lenses are designed to meet a patient’s individual eye health and lifestyle needs. Be sure to talk to your TC Eye surgeon about all of your options, but here is some additional information for you. Just like you and your doctor can choose glasses or contacts to correct your vision, you can choose an advanced-technology lens (also known as a Toric lens) to correct cataracts and astigmatism at the same time. Presbyopia is when your eyes gradually lose the ability to see things clearly up close. It is a normal part of aging. You may start to notice presbyopia shortly after age 40. You will probably find that you hold reading materials farther away in order to see them clearly. Tecnis Symfony® Intraocular Lenses for the treatment of cataracts provide high-quality continuous vision so patients can see clearly at near, intermediate and far-away distances, and points in between, while wearing glasses less. 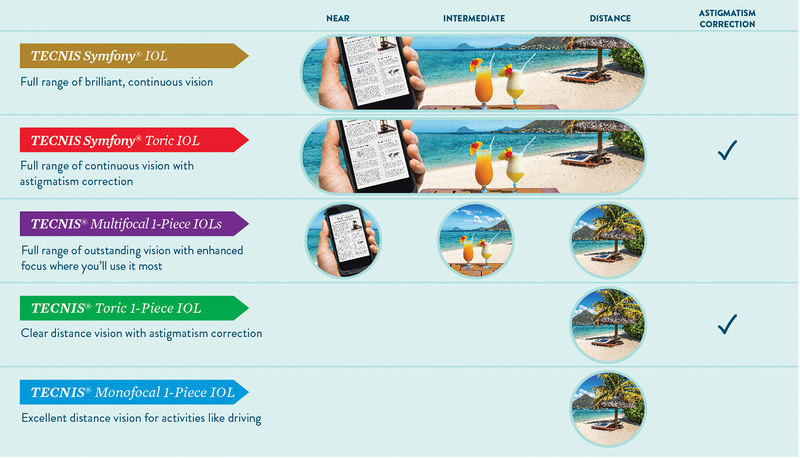 The first in a new category of intraocular lenses (IOLs), the Tecnis Symfony® lenses are the only lenses in the United States that provide a full range of continuous high-quality vision following cataract surgery, while also mitigating the effects of presbyopia by helping people focus on near objects. Once cataracts are removed, they can not return although a film (called a posterior capsule opacification) behind the newly implanted lens can develop and make your vision cloudy again. This condition is common and is easily treated by our doctors using a YAG laser to painlessly and quickly restore your vision to as crisp as it was following cataract surgery. Cataract surgery is considered one of the safest surgical procedures in the United States. However, some common risks are infection; inflammation; tearing of the posterior capsule of your lens; visual effects like seeing halos around lights, glare; leaking from the incision; secondary cataracts (cells growing on the new lens) or cystoid macular edema (swelling). Your TC Eye surgeon will discuss your specific needs and risks, based on the current condition of your eyes, before your surgery is scheduled. Visit https://www.mycataracts.com to learn more about cataracts, surgical options, and experience. Request an appointment with the board-certified cataract surgeons at Traverse City Eye for your cataract treatment and care. You can trust our caring eye doctors as thousands of Grand Traverse area residents and beyond have for many years!